Fr. Jeanne D'Arc (zhän därk), 1412?–31, French saint and national heroine, called the Maid of Orléans; daughter of a farmer of Domrémy on the border of Champagne and Lorraine. ..... Click the link for more information. . Joan won the aid of Robert de Baudricourt, captain of the dauphin's forces in Vaucouleurs, in obtaining an interview with the dauphin. She made the journey in male attire, with six companions. Meeting the dauphin at Chinon castle, she conquered his skepticism as to her divine mission. She was examined by theologians at Poitiers, and afterward she was furnished with troops by Charles. , d. 1442, bishop of Beauvais, France, president of the ecclesiastic court that convicted (1431) Joan of Arc at Rouen. His violent partisanship for the English made a fair trial impossible. ..... Click the link for more information. and other French clerics who supported the English. Joan of Arc. Courtesy Fortean Picture Library. In the countryside of Domremy, France, Joan of Arc was known as Jeanette, with the surname of Arc or Romée. She's also mentioned in contemporary documents as Jeanne, commonly called la Poucelle, the Maid. She was born on January 6, 1412 to Jacques d'Arc and Isabelle de Vouthon, two devout Catholics. Her two brothers were Pierre and Jean du Lys. Her father owned horses and cattle and was the head man of his village of Domremy. Joan was very pious and, while the other girls her age were dancing, she chose to attend church. When Joan was thirteen, she was in her father's garden when she heard a voice she believed came from God. During the next five years she heard voices two or three times a week and was able to distinguish those of Saints Catherine, Margaret, and Michael. They even appeared to her, wearing crowns. She was determined to remain a virgin and lead a godly life. The Hundred Years War between France and England, over who should rule France, was in full swing. The dauphin Charles, son of Charles VI, battled the English, who had control of large portions of the country. Joan's voices told her to help the dauphin and to see that he was crowned king of France. In May 1428, Robert de Baudricourt, commandant at Vaucouleurs, about twelve miles from Domremy, was approached by Joan. She was accompanied by Durand Lassois, a relative on her mother's side. Joan told Baudricourt that she had been sent by God to place the dauphin on the throne, and she would like to speak with him. The commandant sent her home again. In July 1428 the village of Domremy was threatened by the English and the inhabitants retreated to Neufchâteau. It was October before they were able to return, only to find the village burned to the ground. The English, meanwhile, had laid siege to Orléans. When news of this reached Domremy, Joan again set out to see the dauphin. Again, at Vaucouleurs, she encountered Robert de Baudricourt. She also met a young squire, Jean de Metz, in whom she confided. He lent her men's clothes. Baudricourt finally authorized her departure for Chinon, where Charles had his court. The people of Vaucouleurs bought her a horse and she was given a sword. Louis de Bourbon, count of Vendôme, presented her to the dauphin, who talked with her for two hours. According to Jean Pasquerel, her confessor, she told him, "I am God's messenger, sent to tell you that you are the true heir to France and the king's son." Charles had her interrogated by a commission, presided over by the archbishop of Riems, who found her honest and ruled in her favor. Joan then assured Charles that she would raise the siege of Orléans and have him crowned. In a suit of "white armor" Joan, accompanied by Gilles de Rais, led an army of 4,000 men, and on the night of April 28, they entered Orléans. On May 5, they stormed the bastille and captured the Tourelles. On May 8, they held the first thanksgiving procession, which was the origin of what has become the great Festival of Orléans. Joan went on to Troy, and then Reims, by July 14. Two days later Charles was crowned King Charles VII of France, with Joan standing beside him. On December 29, 1429, Joan was ennobled and her village exempt from taxation. The following May, Joan attempted to raise the siege of Compiègne. She and her forces made a sortie against the Burgundian camp, and in the process, Joan was taken prisoner by the Duke of Burgundy, an English ally. He handed her over to the Bishop of Beauvais, also an English ally. On January 3, 1431, Joan was passed on to Pierre Cauchon, bishop of Beauvais, an ambitious man who hoped to obtain the vacant see of Rouen. She was to be tried by tribunal, which had been selected by Cauchon and consisted of ten Burgundian theologians, twenty-two canons of Rouen (all in the hands of the English), and some monks of different orders. Interrogation began on February 21. Judgement was to be based on seventy different points, including charges that she was a diviner, prophetess, sorceress, witch, and conjurer of evil spirits. Eventually these charges were dropped to twelve. Her judges were of the opinion that her visions were worthless and denied her the gift of prophecy. They censured her for dressing in masculine clothing and for "sinful pride" and for believing that she was responsible only to God and not to the Church, which the judges represented. This last was the charge that most incensed her accusers. On May 23 Joan was taken to the cemetery of Saint-Ouen and sentenced to be burned at the pyre unless she submitted. Tired and worn out, Joan signed what was presented to her and was returned to her cell to serve out a sentence of life imprisonment. She was given a woman's dress, but she either did not put it on or else she returned to her men's clothing, for on May 27 Cauchon found her so dressed and declared her to have relapsed. He handed her over to the English secular arm. On May 30 she was made to appear in the Old Market Square of Rouen, although she had again been dressed as a woman. There she was burned. Joan was not executed for witchcraft, but for being a relapsed heretic. It has been said that throughout Joan of Arc's capture and imprisonment, Charles made no attempt to assist her or obtain her release. In fact, on December 15, 1430, upon hearing the news that Joan had fallen into the hands of the duke of Burgundy, Charles sent an embassy to Philippe le Bon, saying that if there was nothing that could be offered to set Joan free, then Charles would exact vengeance for her upon Philippe's men that he held captive. There is correspondence that states, "The English wished to burn her (Joan) as a heretic, in spite of the Dauphin of France who tried to bring threatening forces against the English." But Charles's attempts seemed half-hearted. Finally, in 1450, he instituted a preliminary inquiry into her trial and execution, but it was not fully followed through. It wasn't till June 16, 1456 that the judgement was annulled by Pope Calixtus III. Joan was finally beatified in 1909 and canonized by Pope Benedict XV in 1920. Joan of Arc. When Joan was about 12 years old, she began hearing voices that she believed were sent by God. She was later burned at the stake by the British after being ruled a heretic. Courtesy Fortean Picture Library. In the countryside of Domremy, France, she was known as Jeanette, with the surname of Arc or Romee. She is also mentioned in contemporary documents as Jeanne, commonly called la Poucelle, the Maid. She was born on January 6, 1412, to Jacques d’Arc and Isabelle de Vouthon, two devout Catholics. Her two brothers were Pierre and Jean du Lys. Her father owned horses and cattle and was the head man of his village of Domremy. Joan was very pious; while the other girls her age were dancing, she chose to attend church. When Joan was thirteen, she was in her father’s garden when she clairaudiently heard a voice she believed came from God. During the next five years she continued to exhibit this mediumistic ability, hearing spirit voices two or three times per week, and claimed to be able to distinguish between Saints Catherine, Margaret and Michael. They even appeared to her clairvoyantly, wearing crowns. She determined to remain a virgin and lead a godly life. The Hundred Years War between France and England, over who should rule France, was in full swing. The dauphin Charles, son of Charles VI, battled the English who had control of large portions of the country. Joan’s spirit voices told her to help the dauphin and get him crowned King of France. In May 1428, Robert de Baudricourt, commandant at Vaucouleurs, about twelve miles from Domremy, was approached by Joan. She was accompanied by Durand Lassois, a relative on her mother’s side. Joan told Baudricourt that she had been sent by God to place the dauphin on the throne, and she would like to speak with him. The commandant sent her home again. In July 1428, the village of Domremy was threatened by the English and the inhabitants retreated to Neufchâteau. It was October before they were able to return, only to find the village burned to the ground. The English, meanwhile, had laid siege to Orléans. When news of this reached Domremy, Joan again set out to see the dauphin. Again, at Vaucouleurs, she encountered Robert de Baudricourt. She also met a young squire, Jean de Metz, in whom she confided. De Metz lent her men’s clothes. Baudricourt finally authorized her departure for Chinon, where Charles had his court. The people of Vaucouleurs bought her a horse and she was given a sword. Louis de Bourbon, count of Vendôme, presented Joan to the dauphin, who talked with her for two hours. According to Jean Pasquerel, her confessor, she told him, “I am God’s messenger, sent to tell you that you are the true heir to France and the king’s son.” Charles had her interrogated by a commission presided over by the Archbishop of Riems, who found her honest and ruled in her favor. Joan then assured Charles that she would raise the siege of Orléans and have him crowned. In a suit of “white armor,” Joan, accompanied by Gilles de Rais, led 4,000 men and on the night of April 28 entered Orléans. On May 5, they stormed the Bastille and captured the Tourelles. On May 8 the first thanksgiving procession was held, the origin of what has become the great Festival of Orléans. Joan went on to Troy and then Reims by July 14. Two days later Charles was crowned King Charles VII of France, with Joan standing beside him. On December 29, 1429, Joan was ennobled and her village exempt from taxation. The following May, Joan attempted to raise the siege of Compiègne. She and her forces made a sortie against the Burgundian camp. Joan got cut off and was taken prisoner by the Duke of Burgundy, an English ally. He handed her over to the Bishop of Beauvais, also an English ally. On January 3, 1431, Joan was passed on to Pierre Cauchon, bishop of Beauvais, an ambitious man who hoped to obtain the vacant see of Rouen. She was to be tried by tribunal, which had been selected by Cauchon and consisted of 10 Burgundian theologians, 22 canons of Rouen (all in the hands of the English), and some monks of different orders. Interrogation began on February 21. Judgement was to be based on seventy different points, including charges that she indulged in divination, had prophetic dreams, was a sorceress, witch, and conjurer of evil spirits. Eventually these charges were dropped to twelve. Her judges were of the opinion that her visions were worthless and denied her the gift of prophecy. They censured her for dressing in masculine clothing and for “sinful pride” and believing that she was responsible only to God and not to the church which the judges represented. This last was the charge that most incensed her accusers. On May 23, Joan was taken to the cemetery of Saint-Ouen and sentenced to be burned at the pyre unless she submitted. Tired and worn out, Joan signed what was presented to her and was returned to her cell to serve life imprisonment. A woman’s dress was given to her but she either did not put it on or else she returned to her men’s clothing, for on May 27, Cauchon found her so dressed and declared her to have relapsed. He handed her over to the English secular arm. On May 30 she was made to appear in the Old Market Square of Rouen, though she had again been dressed as a woman. There she was burned for being a relapsed heretic. 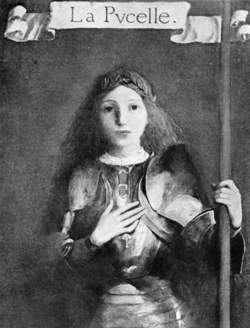 It has been said that throughout Joan of Arc’s capture and imprisonment, Charles made no attempt to assist her or obtain her release. In fact on December 15, 1430, hearing the news that Joan had fallen into the hands of the Duke of Burgundy, Charles sent an embassy to Philippe le Bon saying that if there was nothing that could be offered to set Joan free, then Charles would exact vengeance for her upon Philippe’s men that he held captive. There is correspondence that states, “The English wished to burn her [Joan] as a heretic, in spite of the Dauphin of France who tried to bring threatening forces against the English.” But Charles’s attempts seemed half-hearted. Finally in 1450, he instituted a preliminary inquiry into her trial and execution, but it was not fully followed through. It wasn’t till June 16, 1456 that the judgement was annulled by Pope Calixtus III. Joan was eventually beatified in 1909 and then canonized by Pope Benedict XV, in 1920. (in French, Jeanne d’Arc). Born circa 1412, in Domremy; died May 30, 1431, in Rouen. Popular French heroine. Leader of the French people’s struggle for liberation from the English during the Hundred Years’ War (1337–1453). Joan of Arc, the daughter of peasants, was born in a warravaged village in Lotharingia. A fanatically religious woman, Joan believed that she was foreordained to liberate France. In February 1429, after much effort, she secured an audience with the dauphin Charles and persuaded him to initiate decisive military actions. Placed in command of the army, she inspired the troops, and on May 8, 1429, she liberated Or-leans from the English (which led to her being called the Maid of Orleans). After a series of victories, Joan led the army to Reims, where she was instrumental in consecrating the dauphin as King Charles VII on July 17, 1429. The scope of the people’s war and Joan’s enormous popularity frightened the king and the court aristocracy. Subsequently, Joan was virtually removed from military leadership. On May 23, 1430, during a French sortie from the besieged city of Compiegne, she was captured by allies of the English, the Burgundians. They sold her to the English, who took her to Rouen, where an ecclesiastical court accused her of heresy and witchcraft. She was burned at the stake. In 1456, Joan of Arc was triumphantly rehabilitated by a new trial in France. In 1920 the Catholic Church canonized her. Skazkin, S. “Zhanna d’Ark—geroinia frantsuzskogo naroda.” In Kniga dlia chteniia po istorii srednikh vekov, part 2. Moscow, 1951. RozentaT, N. N. Zhanna d’Ark: Narodnaia geroinia Frantsii. Moscow, 1958. Raitses, V. I . Zhanna d’Ark. Leningrad, 1959. Levandovskii, A. P. Zhanna d’Ark. Moscow, 1962. Liublinskaia, A. D. “Zhanna d’Ark.” In the collection Srednie veka. Moscow, 1962. Fasc. 22. Hanotaux, G.Jeanne d’Arc. Paris, 1911. Waldman, M.Joan of Arc. London, 1935. 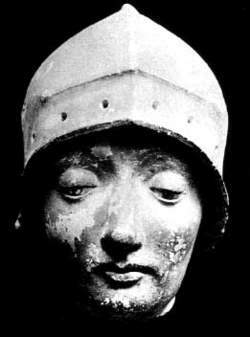 Calmette, J. Jeanne d’Arc. Paris, 1946. Stolpe, S. Das Mädchen von Orlyéans. Frankfurt am Main, 1954.